I’m a big fan of Izakayas and in general the food served at these establishments in Vancouver is fairly good. However, the biggest draw for me is how the genre of food can so easily bring people together. It’s the perfect type of eatery, with its energetic atmosphere, to shoot the breeze with your friends and unwind after a long workweek over a mega pitcher of beer and some tasty food. The menus are diverse (there’s something for everyone), food is easy to share and it’s relatively inexpensive. For the most part you not going to break the bank if you re-order a dish you really enjoyed or had the unfortunate of selecting a dish that was not to your liking. Out of the all the izakaya groups, I’m the least familiar with the Hapa chain of restaurants. The one visit I made many years ago to the Hapa in the Westend, gave me the notion that it was very different than the other eateries in its category. My impression of the Hapa group is to liken them to the image conscious, slightly pricier and more polished chains like Cactus Club, the Keg & Earls that populated our region. Such a long time has passed since I last stepped into a Hapa restaurant, I wanted to see if my opinion of them still held true. The Hapa in Coal Harbour is close to my office and is the only location in the group to open for lunch. My co-worker, the Distributor, had some time and we decided to head down for a meal. Upon entering the Hapa, it was like walking into a Keg or a Cactus Club with its polished metal lighting, sleek furniture, rich wood trim and attractive staff. Upon browsing thru the menu, I felt this Hapa location was more pan Japanese than specifically Izakaya. With options for sushi, noodles and small plates, the menu was designed to cater to everyone, which makes sense given its proximity to the cruise ship terminal. The Distributor and I decided to share the Hapa Roll (sans asparagus, my stupid allergies), Renkon Gyoza Tempura, the baked sable fish and a trio of sides (green salad, rice and miso soup) to help round out our lunch. In addition my cohort ordered the small sashimi salad, which looked pretty and fresh, for herself. 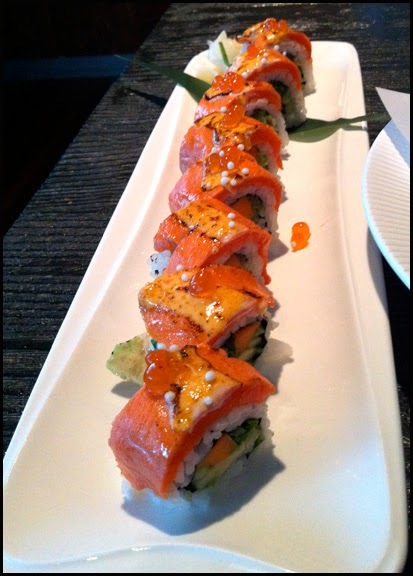 The Hapa Roll consisted of carrots, cucumbers, sprouts, avocado, topped with salmon and ikura that has been trendily torched to help enhance the fat flavour in the salmon. Overall it was a well constructed and tasty roll. The Renkon Gyoza Tempura is essentially a ground pork gyoza filling sandwiched between two thinly cut lotus roots slices. The entire package is dipped in tempura batter and then deep-fried. I really liked the dual crunch of the tapas. First you have the non greasy crisp tempura batter with a delicate crunch that yields and then melts away with each chew. This is contrasted with the firmness of the sweet lotus root that has a crunch that is crisp and unrelenting with eat bite. The filling was nicely seasoned with a slight tinge of ginger much like other gyoza offerings around town. I enjoyed the novelty, flavour and texture of the Renkon Gyoza Tempura. Initially, I thought the Gindara looked a too pale when it arrived. However it was well seasoned with the miso-sake marinade that matched, not overwhelmed, the natural buttery taste of the black cod. The fish was baked perfectly with each segment just flaking off. 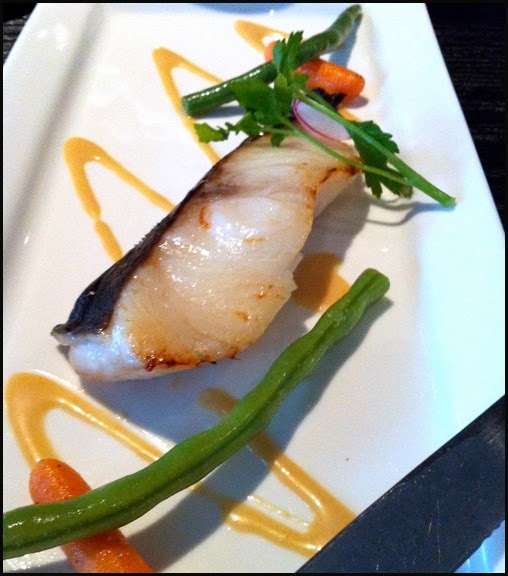 The sable fish was juicy, exhibited its natural umami and fatty flavours well and as a result was delicious. In a city full of black cod entrees, Hapa’s edition was very good. Much liked the stylized decor of restaurant, the plating of each of the dishes was beautiful and more refined than the other Izakayas I’ve visited. The food at the Coal Harbour Hapa location was very enjoyable, well executed and visually appealing. Sitting in the spacious leather booth, I could help but wonder if I had been looking the Hapa resturant group incorrectly. Instead thinking of it as an expensive izakaya that lacks the charm and ambiance of its competitors, perhaps I should be thinking of Hapa, at least the one in Coal Harbour, as an excellent, modern and refined pan Japanese eatery.